"Last Thursday, when Lucy stopped breathing, there is no doubt that a part of me died too. The history of who I am – the accumulation of a million memories from a thirty-one year friendship, the knowledge that at least one person in the world who could see me, that at least one person in the world would always know me - has been washed empty. I picture her blood trickling between the cobblestones, and one of the most important voices in my head, certainly the most constant, goes with it." Tricky reviewing this one. I'm not a fan of "chick lit" by any stretch of the imagination. When I start reading a book in this genre my eyes glaze over. They're just so damned predictable, so formulaic. And the endings, rather than resembling real life tend to be so saccharine, not realistic in any sense of the word. 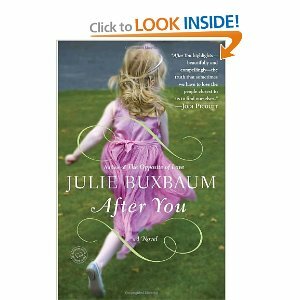 Buxbaum's book wasn't terrible. It wasn't great, but definitely wasn't near the worst book I've ever read. The story intrigued. When Ellie Lerner's best friend is murdered she flies to London to help the family – the husband and eight-year old daughter, try to pick up the pieces of their lives. She becomes part-nanny, part-substitute mother to little Sophie, providing comfort and regularity as best she can. "Sophie's gaze meets mine again, and reality seeps slowly back into her. The nightmare was less nightmare, more nightmarish memory. She's not crying now, but her body goes stiff, like a corpse, when it dawns on her that Mummy isn't coming back to help make the fear go away. She will not bring a glass of warm milk, and rub her back, and stay with her until she falls back asleep. Her eyes are big and frozen with horror." As part of her "therapy," Ellie reads Burnett's The Secret Garden to Sophie. Though selectively mute since her loss, suddenly Sophie begins to engage with Ellie. All thanks to the compelling plot of the book. Now that's my favorite part of the book, that avid reader Sophie's tortured mind can be brought back to life by a delightful book of fantasy. I love that image, and that message. Another good element was the strain on Ellie's marriage caused by her extended stay in Britain. At first begging her to come back, her husband Philip understandably starts losing patience with her dedication to her lost friend's family. Rather than letting them go things alone, Ellie feels it's her responsibility to care for the family her best friend has left behind. But then Ellie learns a dark secret that had been brewing between her best friend, Lucy, and Lucy's husband, Greg. Suddenly her opinion of her deceased friend changes, though she never ceases to love and miss her. But her maternal instincts kick in even more so knowing how this secret would have pulled Sophie's world apart, possibly as much as the loss of her mother. As things between Ellie and Philip decline, Ellie becomes more and more certain a permanent move to Britain is her only option. Ah, but then comes another twist. One that would spoil the plot. But, again, these sorts of books aren't my thing. I can always see through the authors head, figuring out the ending usually halfway through. From there it's a slog to the end. In fact, I skipped a few chapters, jumping to the last. And I was right about how things ended up. Surprise! As far as chick lit goes, this one's well-written. I know the genre has a big fan base, as well as I know I'll never appreciate it. Books that come and go so quickly, replaced in a month by another with an almost identical plot, are unimpressive. I have much better uses of my time. However, I thought I'd try this one – since I do make a go of it once in a while. I was less annoyed by it than usual, but alas, once again, the ending was obvious from a mile away. And I know some enjoy that, preferring the comfort and security of an assured happy or semi-happy, upbeat ending. But I'm not one of them. Give me reality any day. If I want to read fantasy I'll find something in that genre, without the accompanying middle-class angst. Verdict: For what she was aiming at Buxbaum does a good job. Her market will love this book, until a month from now when she's forgotten and another author takes her place. Previous Post A forgotten spine-chiller. Next Post I’ll take Paris.